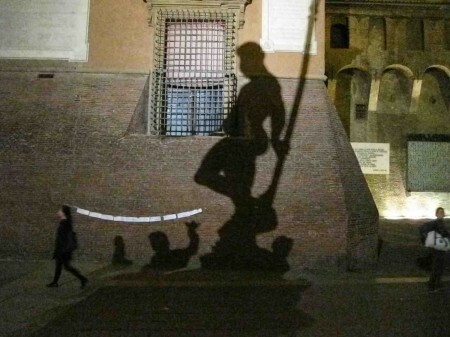 Last week I went to Bologna Children’s Book Fair for the first time – a visually overwhelming experience not just for the amazing array of children’s books from all over the world, but the wonderful architecture of the city itself – this picture shows the shadow cast at night by the statue of Neptune in the main piazza. The exhibition of illustrators’ work was stunning, and unbelievably varied…I was particularly taken with the work of Spanish illustrator Violeta Lopiz, for her dreamy layers of vegetation, and the dancing grasshoppers of Ana Valero Rello, also from Spain but very different in style. I also loved the warm rolling fields of Fereshte Najafi from Iran, and the cool and witty screenprints by Japanese artist Ryo Takemasa, specially the strangely beautiful mosquitoes emerging from a bucket. Inkyng Noh from Korea showed a page where a tiny girl was scooping up all the words with a lawnmower – very clever. There were dozens more, too many to mention – but it’s well worth looking at the gallery of all the selected illustrators from the fair here. I also went to watch a Q&A with I Want My Hat Back author/illustrator Jon Klassen, who advises the student illustrators he teaches to forget about style, and make all the decisions about the story – and to look at other media not other illustrators (oops). Later on I met Bridget Strevens Marzo, who was showing her work at the SCWBI stand. I love her Mini Racer book – echoes of Richard Scary but done in a whole new way, and so much detail for small eyes to look at. Three days in Bologna went extremely fast – but there was still time for several scoops of strachiatella gelato, a few glasses of prosecco and a visit to Bologna’s Medieval Museum – a sort of V&A in miniature stuffed with everything from carved ostrich eggs to a lovely, tiny 15th century bronze of a dog scratching his ear just exactly as a dog would. A fabulous trip with my illustrator friends Jen Miles and Kim Geyer. This entry was posted in General news on March 25, 2012 by Jane Porter. Going to the Bologna fair is on my life list. One day!